What Excuse Will You Make When Guitar Students Ask You About Your Guitar Teaching Training - And You Don't Have Any? When you get caught with your pants down because you've been taking their money not yet having earned the right to do so, you'll crawl across broken glass on your bare naked knees to finally get 'real' training on how to teach guitar… Let's avoid that and get you trained right here, right now, today. You see, having no actual guitar teacher training is not only bad for your students, it also severely limits your ability to attract more students, earn more money and build a highly successful guitar teaching business. They copy from all the other untrained guitar teachers out there everywhere, giving their students mediocre results as they limp along earning barely $20,000 per year ($30,000 if they are 'lucky') when they could easily earn $100,000 if they knew what to do, how to do it and then 'actually' did it. Listen, just because the world is filled with hacks who call themselves 'experts' doesn't make them so. Having lots of 'experience' doing the 'wrong' things and producing mediocre results doesn't make them good at anything except producing lame results. They spin their wheels trying to figure everything out about guitar teaching on their own - this simply doesn't work, if it did, the average guitar teacher would not be so horribly bad at what they do… If you're not consistently producing great results for your guitar students and have a 'thriving' successful guitar teaching business, then in my book you're not yet great at what you do… but you can be. 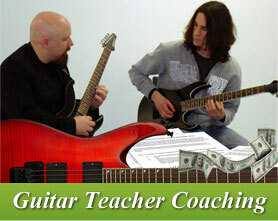 If you are new to teaching guitar and need help getting started, click here.